Italy does Christmas in a big way! In fact, our celebrations often go on for around three weeks! There are some fantastic Italian Christmas traditions that we can enjoy here in Liverpool, not least the fact that Italian Christmas dinner is always a decadent affair AND it is not limited to Christmas day alone. Our Italian Christmas dinner here at Villa Romana definitely isn’t limited to one day of the year. You can join us any time from the 30th November to Christmas Eve, for lunch or dinner, so why not embark on the celebrations early, in the name of Italian Christmas tradition?! Did you know that another of our Italian Christmas traditions is that we don’t eat meat on Christmas Eve? Instead, on that date we enjoy vegetable and fish dishes. Our nod to that tradition is that this year’s Italian Christmas dinner menu here to Villa Romana includes a selection of vegetarian and fish based starters, as well as a beautiful fillet of salmon, pan fried with cherry tomatoes, with a cream and basil sauce. These dishes are available whether you join us for lunch or an evening meal. Of course, for those who prefer a meat option, turkey, lamb and, in the evenings only, a dish of prime sirloin steak are also available. No Italian Christmas dinner menu would be complete without a mouthwatering vegetarian main meal option either, so we also have a parmigiana with roasted aubergines. The highlight of any Italian Christmas dinner is always the dessert. Here at Villa Romana we are famous for our delectable dessert trolley selection and, as you might imagine, even that is stepped up a notch for the festive season. Your selection from our available desserts is included in our Christmas dinner menu and believe us, nobody is going to leave the table with room to fill! 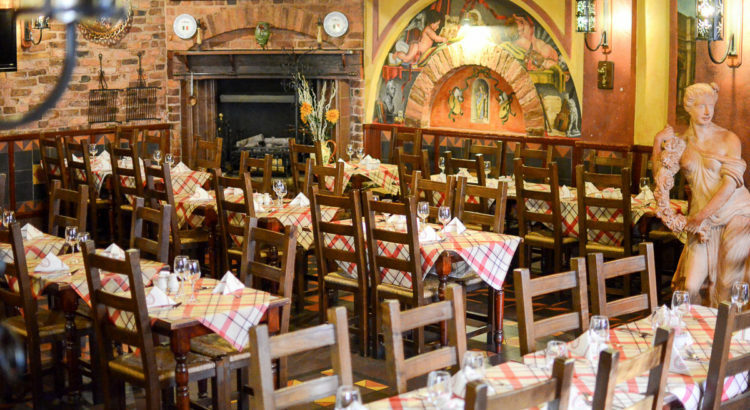 If you are looking for an Italian restaurant in Liverpool for a Christmas meal with colleagues, friends or family make it Villa Romana and you won’t be disappointed.